I confess that the crinkle-cut beets in the salad bars of my childhood, usually in a clear bin between the sprouts and cottage cheese, were one of my favorites. As a kid, I loved their slippery texture and the way they colored my Ranch dressing pink. This is because I didn’t know any better. In the brand of 1980’s suburbia where I grew up, nothing was home-canned. We bought what was available at the store and ate what restaurants had to offer. The concept of doing our own food, much less creating the space for it to emerge from ground, coop or hive, was as foreign to me as the faraway places that grew our imported olives. Beets from Rising River Farm. I tasted home-canned beets for the first time when I was in my twenties, at a homey Midwest kitchen table, and had to stop myself after three servings. 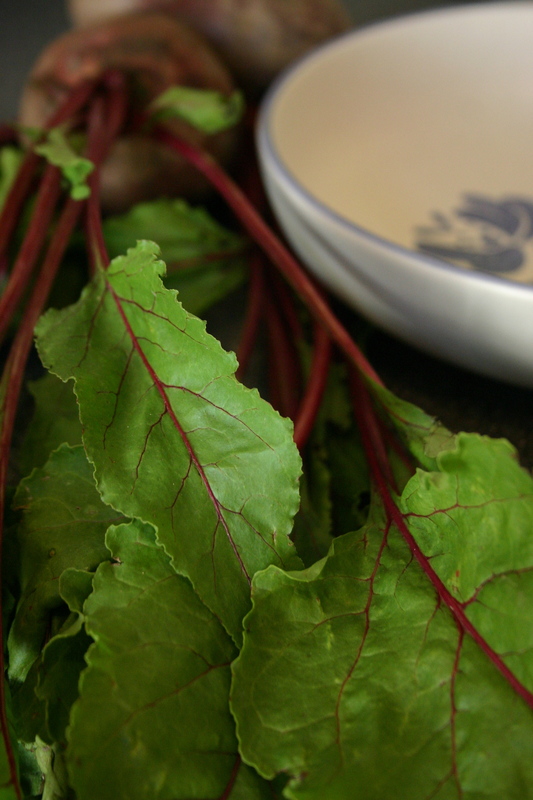 The experience made beets a touchstone of the DIY food movement for me. Years later, I discovered the candy-like flavor of fresh, roasted beets and a recipe that combines them with orange slices, basil and balsamic. 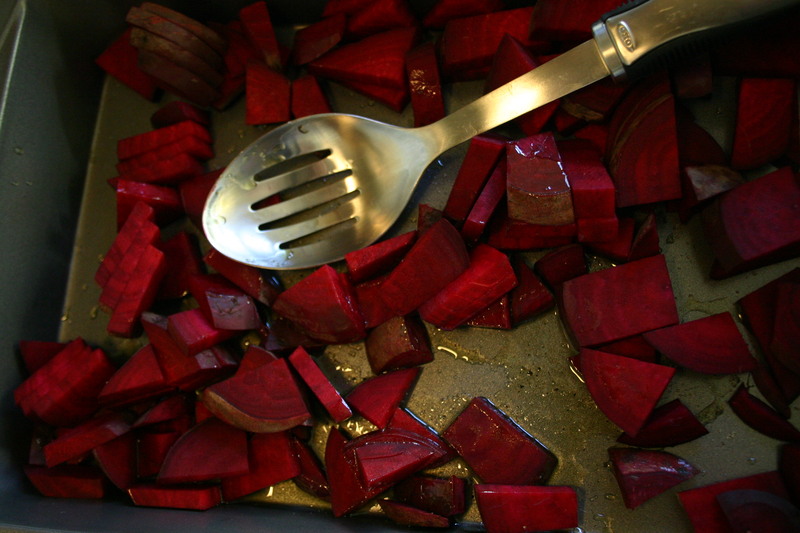 I could roast my own beets and they tasted better, much better, than the machine-cut version I’d liked as a child. I was hooked. A note in one of my cookbooks (the same one with the orange and balsamic recipe) notes that when roasting beets, they don’t need to be peeled. Did you catch that? Because it makes it so much easier. Beets don’t need to be peeled. Beets don’t need to be peeled! That means less stained fingers and, I presume, more vitamins. Yea. 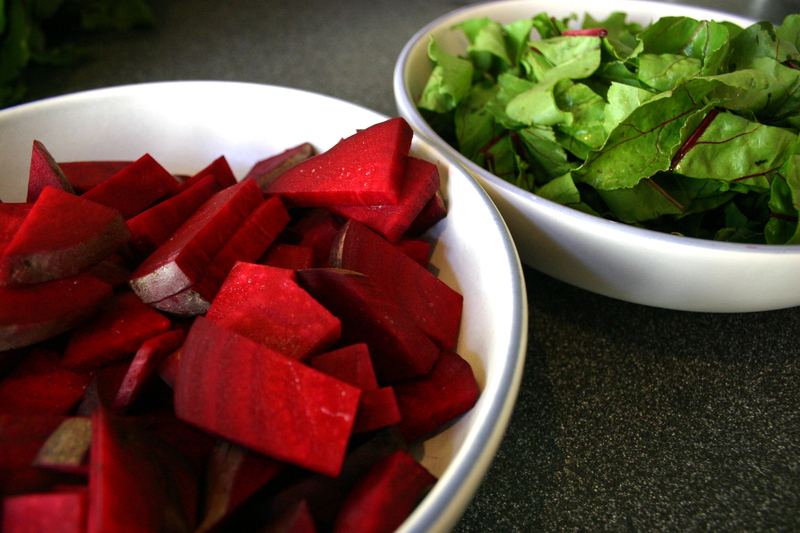 And, as their bright colors might suggest, beets are very good to eat. They contain folate, magnesium and potassium and the greens are full of vitamin C, iron and calcium. 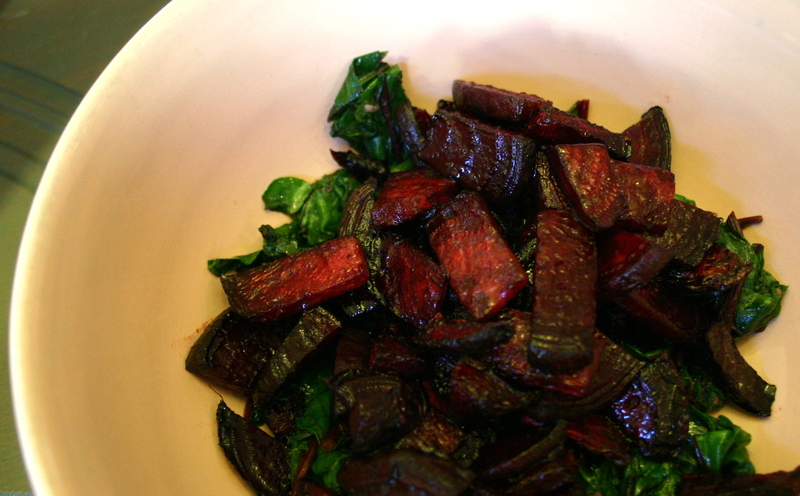 Today I made some roasted beets because writing about them made me hungry. I’m visiting Washington D.C. and beets are in season here, too. So we got a bunch and cooked them up. Soon buttery golden beets and Chioggias (the kind with a bulls-eye of concentric circles inside) will be in the markets, too. 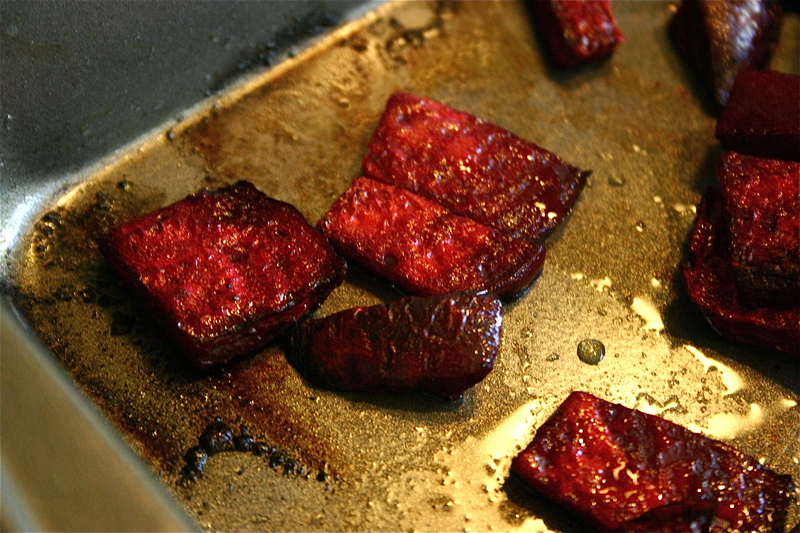 Chop beets into chunks thin enough to roast quickly (today mine were about 1/4 inch). Chop greens and set aside. Toss beets with olive oil, salt and pepper in a pan with sides. Roast for about 10 minutes and mix them up a bit. Roast another 10 or 15 minutes. About five minutes before beets are done, mince garlic and saute with greens in olive or coconut oil until wilted and bright green. Test beets with a fork. They should be very soft and have a bubbly skin. 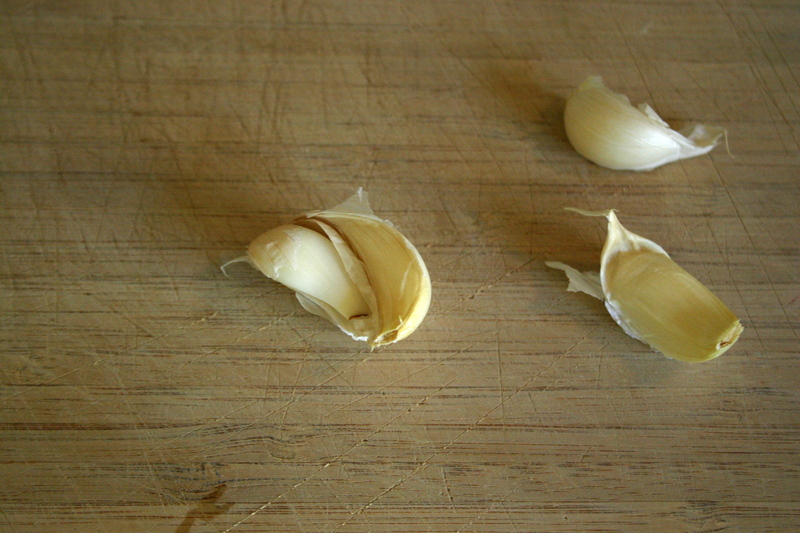 A few around the edges of the pan will have browned corners. These are the best ones. Serve over the sauteed greens. Tonight, I served mine in a pink bowl that belonged to my great-grandmother, which felt very sweet (like the beets). 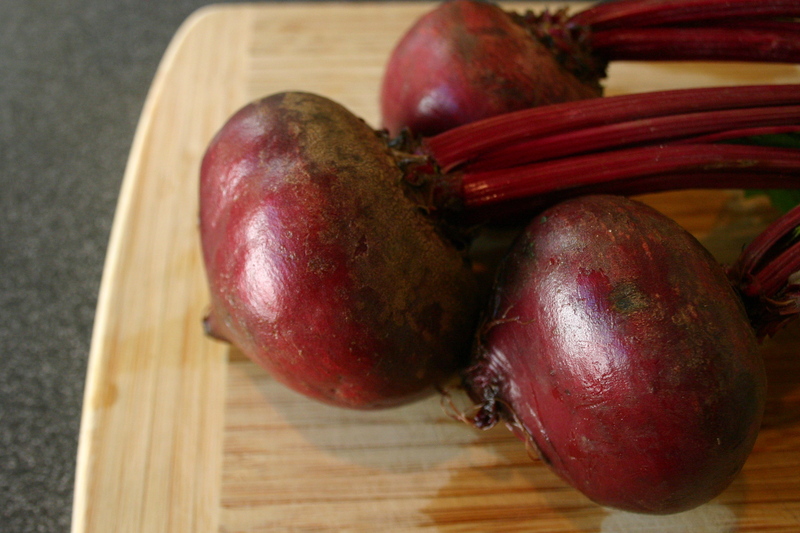 Bring back your beets on Thursday and we’ll cook up something else sweet and delicious. This entry was posted in Recipes, Roots, Summer Vegetables and tagged Beet, CSA, Greens, Local, Organic. Bookmark the permalink.